Anaphylaxis is a life threatening condition that results due to an allergic reaction when a person is exposed to an allergen he or she is allergic to. This may cause shock, a drastic drop in blood pressure and breathing difficulties. People with allergies may respond to an allergen within a few minutes or exposure. Sometimes, the reaction is delayed so the allergic reaction does not occur with an apparent trigger. Due to its severity, it is essential that immediate medical help is sought for treatment of the condition. 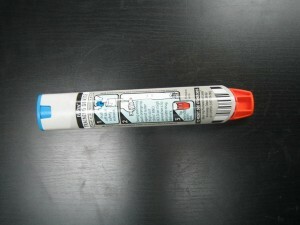 Anaphylaxis is a systemic condition, which means the whole body is affected. The reaction may vary as some experience mild symptoms while some experience, severe life threatening symptoms. Other symptoms include headaches, red or itchy watery eyes, uterine contractions, a metallic taste in your tongue, anxiety and irritability. There are many cases in which casualties feel as if they are about to die, this condition is called ‘feeling of impending doom’. In most severe cases, the person may suffer from low blood pressure, unconsciousness or difficulties in breathing. It is important that you call for emergency medical help immediately and not wait for symptoms to fade away. Allergic reactions may persist until the allergen is in contact with the casualty’s body. If help does not show up quickly, you may try to remove the allergen yourself. prescription for the drug and you must carry it at all times if you are prone to suffer from allergic reactions. Epinephrine becomes a vital lifesaver that quickly controls an allergy within a few minutes, during a severe anaphylaxis attack. Once you have used the syringe, you will notice a needle at the back of the device. Carefully dispose the needle in a safe place so that nobody else is infected. By taking a St Mark James training course (either standard, childcare or emergency first aid) you will learn proper usage of EpiPen’s (and other epinephrine injectors) , receive “hands on” training and learn about the legal implications of aiding with medications. to give Piriton first and then epi when the symptoms becmoe worse then that is what you should do. Remember allergists do this for a living. Our action plan says to give 1 dose of benadryl if symptoms becmoe worse and breathing becmoes labored administer epi-pen. If we are traveling we have an epi-pen with 2 injectors. So our instructions for when we are not close to a hospital is to administer 2nd epi-pen if the first does not slow the response. You can bring someone back if they go into cardiac arrest you can’t physically remove the protein causing anaphylaxis from the body. Our babysitter has a child anaphylactic to eggs and peanuts he takes prednisone and then the epi. Everyone can have a varied plan. Follow what you are instructed to do. Our son knows he goes no where without his back pack! Good luck .you don’t need to live in fear!Add: Remember to educate your child on what he needs to avoid and look for. My son is 3 and if anyone offers him food he knows to say peanuts yucky. At large gatherings I have made him a fun necklace that says I have food allergies don’t offer me food If you make it decorative people will look at it because kids are cute and they want to talk to them. And you want to know you are safe by letting them play. We have also been known to announce to smaller gatherings about his allergy. Be proactive without being that freaky over protective parent.